During the CUIT 2018 International Education Week from Dec. 5 to Dec. 10, a series of academic lectures were held in Hangkonggang Campus and Longquan Campus respectively. Six experts from the University of New Hampshire (UNH) USA brought nine brilliant academic lectures to CUIT teachers and students. The students who attended these lectures came from 16 colleges with full enthusiasm and eagerness for knowledge, and they enjoyed this academic feast a lot. Professor Robert McGrath gave an academic lecture entitled The Evolution of Analytics and Data Science in the Global Landscape, covering the development of computer network applications, search engines, the Internet of Things applications, and the application of Analytics and Data Science Programs in the U.S. 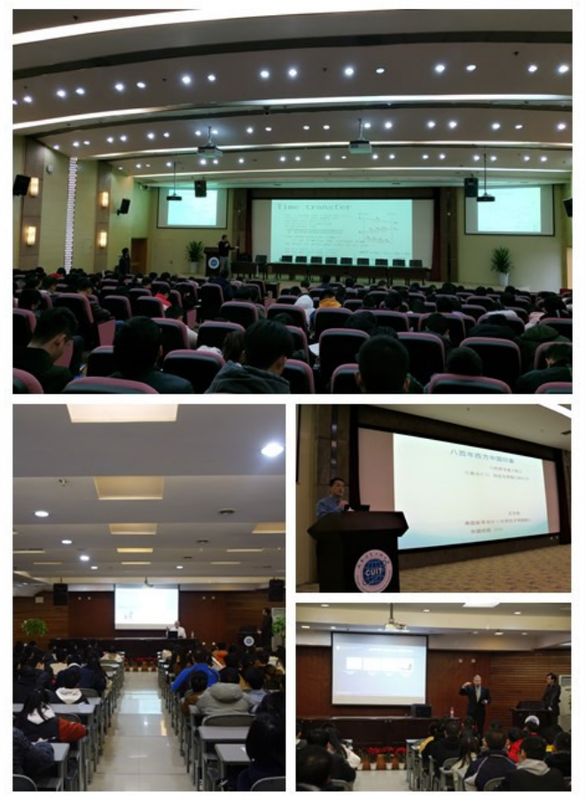 Professor Rudolph Dusek gave an academic lecture entitled Chinese Traditional Science and Modern Science, which covered the summary of Chinese traditional culture, modern culture and the history of scientific and technological development. Professor Lisa Ranfos gave academic lectures entitled Creating Environments with Supporting Materials for Young Children, and Supporting a Strong Image of Children in Early Childhood Settings, introducing that environment is an important factor in children's growth and learning. From her point of view, preschool educators should support children's cognitive development in all aspects, while teachers should use various strategies to create a warm nurturing relationship and lay a foundation for children's growth in all areas of development. Professor Radim Bartos gave academic lectures entitled How to Keep Time – Network-based Precise Time Synchronization and How to Save Time – Methods to Reduce Network Latency. He pointed out that computer science can easily ignore the concept of time, and time is a basic reference when dealing with the physical world. There are three major challenges in studying time, one of which is the communication latency. He also explained in detail the methods utilized to achieve precise time synchronization in the past and at present. Professor Yige Wang and Professor Michelle Dillon gave special lectures on Eastern and Western philosophy, history and culture, explaining the inclusiveness and differences of Eastern and Western cultures. Professors from the UNH were knowledgeable, who interacted frequently with participants attending lectures, creating warm atmosphere discussing.